A regular year consists of 365 days. 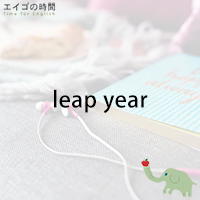 But every 4 years in February one extra day is added, which is known as a leap day in the Gregorian calendar. In other words, when there are 366 days instead of 365 in a year, that year is a leap year. So. A leap year occurs every four years or once every four years. Let’s look at the word “every” in this sentence and see how it’s used. It’s a good expression to learn. For example, trains leave every few minutes. You need to change your banking password every ninety days or once every three months. The population census is conducted every five years. Personally I visit my mother every two weeks and I see my dentist once every six months. A leap year occurs every four years.